We read an article about a person who has gone deaf and the one feeling she distinctly remembers at first was isolation. Although she learned sign language and reading lips to communicate, there are still moments when she has this feeling of overwhelming desolation. It’s like there’s an invisible wall between her and the rest of humanity. With AVA, those moments can be lessened or entirely eliminated. It allows the deaf and hearing impaired to be part of group conversations using a threaded speech-to-text application. Here’s the way it works. The AVA app is downloaded and profiles created. Once everyone is onboard, participants will just talk near the microphones of their phone and the verbal conversations will be converted into a group text which anyone can reply to. There might be pre-work needed but for the family, friends and colleagues of the deaf and hard-of-hearing, it’s the best way to include everyone in the conversation. AVA actually lives up to its commitment to allow those with hearing disabilities to communicate beyond barriers – it breaks the invisible wall and gives the deaf/hearing-impaired a sense of inclusion. The potential of AVA goes beyond family conversations. It can be used in any situation where people are talking. In an environment like this, people with hearing impairments can only follow 20% of the conversation by reading lips. AVA with its current limitations will allow 80% accuracy. AVA’s accuracy of converting speech to text is largely dependent on speech recognition technology being used. As we know, it is not perfect and has not advanced enough for wide-user adoption. Be that as it may, the app has a very simple interface and the set up process is quick and easy. Users have the option to sign-in depending on their hearing abilities and the app will adapt. It is available on both iOS and Android. AVA is aptly described as “a mobile application that transcribes speech into text. AVA, let’s you see in real time ‘who’ says ‘what’ around you!” Since the deaf and hearing-impaired cannot simultaneously read lips of multiple people, they are lost in the conversation. With AVA, they know who is saying what. AVA is an application that meets the need of millions of people who have hearing problems. The app was purposely designed for non-tech users because hearing disabilities knows no demographics. It is randomly distributed. The founders always have these people in mind when they developed the app. Perhaps, this is due to the fact that one of the founders is deaf himself and another with deaf parents. This is one app with a heart solving a social problem and more importantly, giving autonomy to the deaf and the hearing-impaired. Reach more audience! 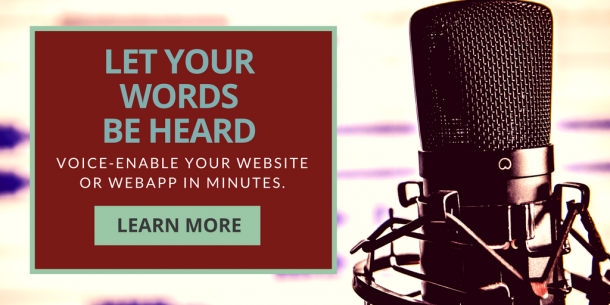 Add voice features to websites and apps across all smartphone, tablet and desktop devices. Try ResponsiveVoice — your effortless text-to-speech solution.